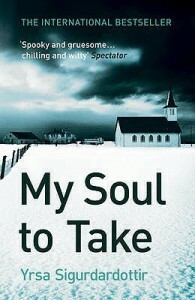 The bestselling Icelandic crime writer returns with the second in a series featuring lawyer Thora Gudmundsdóttir. Sigurdardóttir's crime debut, Last Rituals, marked her break from a prizewinning career as a children's novelist but was also notable for its welcome dose of humour. She does the same here. Gudmundsdóttir is relaxing at a farmhouse health resort when a grisly murder occurs and she discovers that stories about the farmhouse being haunted may link to terrible events decades before. Once again, she must balance her investigation and her private life - a grumpy ex-husband and teenage son, a needy daughter and a new German boyfriend. This is both frightening and funny - a terrific trick if you can pull it off. Tightly plotted storyline linking the present day with past events and a touch of the supernatural. I like Thóra with her dry sense of humour and pragmatic approach and her conversations with 'tag along' boyfriend Matthew are great fun. Maybe a tad too long but an enjoyable book to loose yourself in on a dark winter evening.